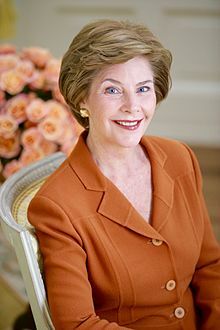 Laura Bush (born Laura Lane Welch on November 4, 1946 in Midland, Texas) was the First Lady (The President's Wife) of the United States from 2001 to 2009. She is the wife of George W. Bush, who was the President then. Mrs. Bush is the only child of Harold Bruce Welch (1912-1995) and Jenna Louise Hawkins(born 1919). Laura and George met and married in 1977. She is the mother of Barbara and Jenna Bush, who were born in 1981. Before she became First Lady she worked as a librarian and a school teacher in Dallas and Austin, Texas.